When your wheel alignment is off, your ability to drive safely is compromised. Sometimes unaligned wheels can be obvious – your car pulls to one side of the road or your steering wheel has a vibration in it from balancing issues. Where do Cameron Park drivers go when they need a wheel alignment? Right to Automotive Services Unlimited. In some cases, you might not even notice your car’s alignment is off. That’s why regular tire alignment checkups are a must-do. If your car alignment feels off – or if it’s simply been a while – come see us at our shop and our alignment experts will take a look. When your wheels are aligned, your car will handle 100% better. 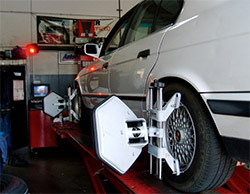 Wheel alignment from Automotive Services Unlimited means long lasting, optimal performance. Our technicians know how to keep your car running straight and smooth. A wheel alignment corrects steering problems, such as pulling to one side, and tire contact issues. If your tires don’t make good contact with the pavement, you lose ride control. Tires are expensive. They last longer when they wear evenly. A wheel alignment and regular tire rotations prevent premature wear. Patterns that indicate you need a vertical alignment include tread wear on the inside or outside edges. A wheel alignment can significantly improve your fuel efficiency, because your wheels no longer fight each other for directional control. Problems with steering and alignment impact the suspension system and vice versa. By keeping your wheels properly aligned, you avoid damage and premature wear of suspension components. In fact, your vehicle might need new shocks or struts—which affect ride height—before a technician can properly perform an alignment. How Did My Wheels Get Out of Alignment?